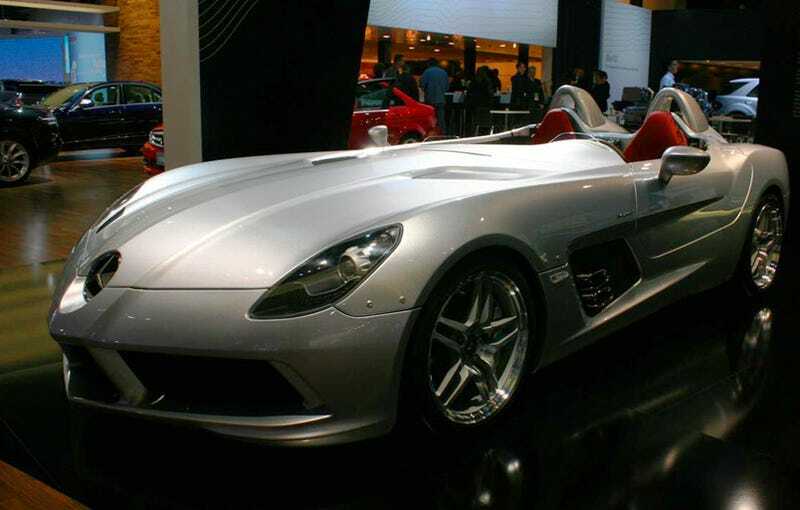 The 2009 Mercedes Benz McLaren SLR Stirling Moss has been unveiled and with just 75 copies of the $1.01 Million boutique supercar being produced, it's a fitting start for the 2009 Detroit Auto Show. The SLR Stirling Moss acts as the finale for the SLR nameplate, and a tribute to one of histories greatest race car drivers. To do that, McLaren chopped the driving experience down to its rawest form — you sit in a carbon fiber chassis, completely exposed to the elements, at one with the wind and the bugs in your face, breathing in the smell of the side-exit exhaust pounding from the 650-hp supercharged 5.5-liter V8. Say what you will about the SLR or the styling or the price, but the SLR Stirling Moss is an awesome example of the melding of racing's past and present.